After a day full of meetings and calls, I decided to go down to the excellent China House at The Grand Hyatt in Mumbai for a drink and a quick dinner. This time I took a seat at the bar, getting a chance to both watch the bartender go about his business of mixing some interesting cocktails, but also to get a chance to obverse the Chinese chefs hard at work turning out dim-sums and roast duck with equal panache at the open kitchens right opposite my vantage point. 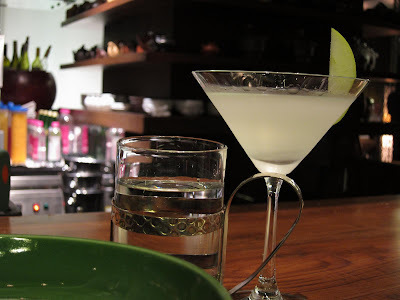 My appletini was served with bowls of spicy glass noodles and boiled peanuts. Both of them addiction forming! The wet towel was a welcome touch, especially since I had just come in from the hot and humid Mumbai streets. 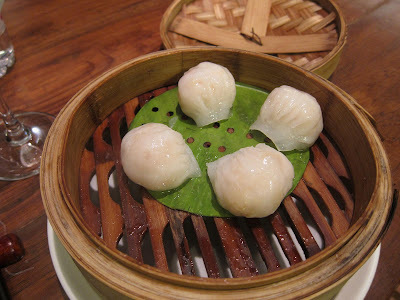 Steamed cystal prawn dumplings were excellent. 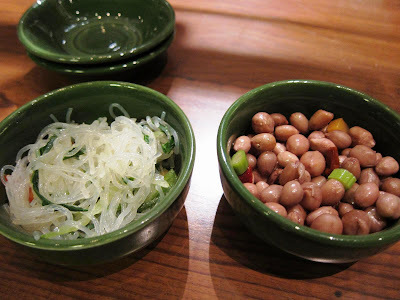 Delicate wrapping, fresh prawns with light spices and crab apple (? ), served steaming. 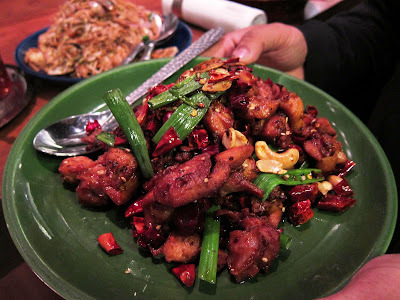 Sichuan chilly chicken with peppercorns and green onions was good but not for the fussy eater. Loads of red chillies and cashews made up this dish. Sichuan seafood noodles with spicy sauce and vegetables seemed a wee bit too oily which took away from the natural flavors and taste of the seafood. The Jasmine tea-ramisu (!) provided a fantastic ending. 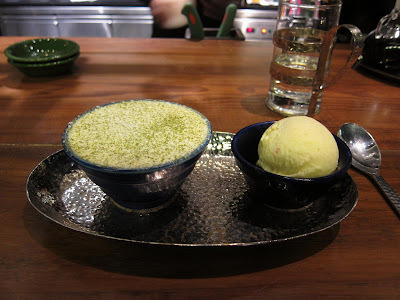 This green-tea flavored tiramisu was served with home made orange-vanilla ice-cream. 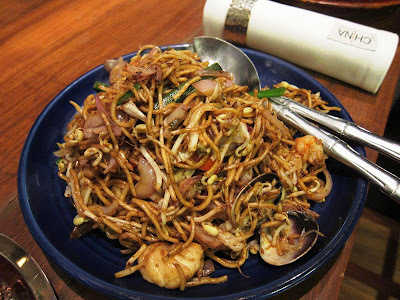 China House is an excellent choice for upscale Chinese cuisine in Mumbai. 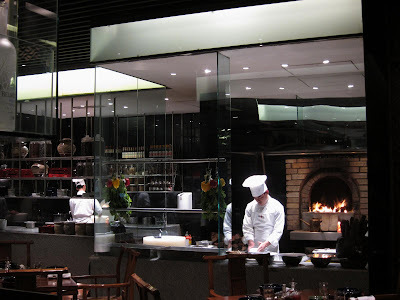 The ambiance is particularly unique with show kitchens, a variety of seating areas, and an exciting bar area. The decor and service matches the high quality of the food served here. This is a place to see and be seen, especially on weekend evenings. I love prawn momos and they are very hard to come by in Bangalore. @Aathira: Haven't eaten momos in a while. Used to do that often when I stayed up in the North. Beautiful photographs and great composition. @Sudhir: Thanks. And welcome to my blog. How are the rates at this place ? recently I had been to MAinland China at Sobo Central, Haji Ali,Nice as usual. 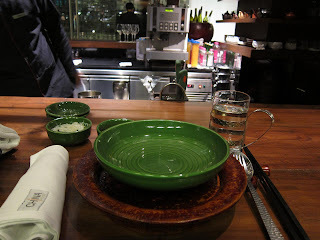 @Nomad: This is a five-star restaurant. As you can expect, the rates are high too. About Rs:1500 per person for dinner. @Harekrishnaji: Haven't eaten at MC other than in Pune.